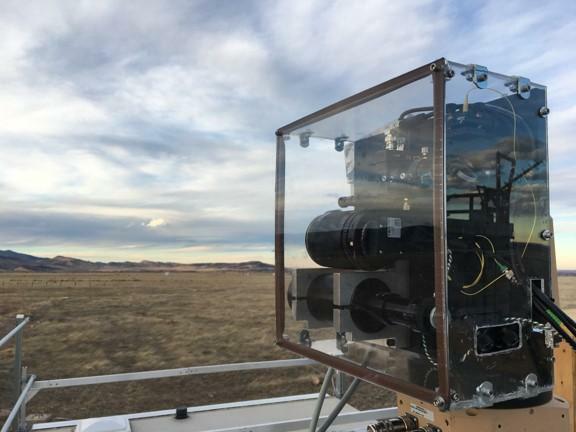 WASHINGTON — Researchers have conducted the first field tests for a new laser-based system that can pinpoint the location of very small methane leaks over an area of several square miles. The new technology could one day be used to continuously monitor for costly and dangerous methane leaks at oil and gas production sites. As a primary component of natural gas, methane can leak during normal oil and gas production or through unknown leaks in production infrastructure. These leaks not only cost oil and gas companies money but also contribute to climate change and can be dangerous to people. Today, a person or team must travel to different sites to check for leaks with a special camera that is sensitive to methane at close distances. This approach is time consuming and could miss methane leaks that are intermittent in nature. "Our approach allows measurements to be autonomous, which enables continual monitoring of an area," said co-lead author of the study Sean Coburn, from the University of Colorado in Boulder. "This technology could play a significant role in reducing methane emissions from production activities, easing tension between urban development and oil and gas production and helping avoid disasters like the 2015 Aliso Canyon methane storage leak that released 90,000 metric tons of methane into the atmosphere." In Optica, The Optical Society's journal for high impact research, researchers from the University of Colorado, the National Institute of Standards and Technology (NIST) and the National Oceanic and Atmospheric Administration (NOAA) showed that their system can uniquely detect slow, low-volume methane leaks from a kilometer away in an outdoor setting. They demonstrated that the system can detect leaks with a flow rate equivalent to just 25 percent of a person's resting breathing rate. The method could also be used to measure other gases to provide new insights into air pollution. "Our system is based on frequency comb laser spectroscopy, which stemmed from the Nobel-prize winning work of Jan Hall at University of Colorado," said Coburn. "Because of recent advances, we were able to take this technology out of the lab and use it in the field for the first time. Combining this precision spectroscopy technique with new computational methods allowed us to pinpoint methane sources and determine emission rates with unparalleled sensitivity and range." Methane and other gases absorb light at specific infrared wavelengths, creating an absorption spectrum that can be used like a fingerprint to detect gases in the air. The new system uses a scanning laser beam with discrete reflectors placed around the field to determine the amount of methane in air that intersects each beam path. Comparing measurements from two laser beam paths shows if a leak is present in the area between the paths. The exact location and size of the leak is determined using newly developed methods which utilize atmospheric models that simulate how gases are moving across the area at the time of the measurement. A key component of the system is a frequency comb laser, which emits hundreds of thousands of infrared wavelengths, rather than the one wavelength emitted by traditional lasers. Using this type of laser for spectroscopy enables fast measurements over a broad range of wavelengths with very high resolution, which proved important for distinguishing gases that absorb at similar wavelengths such as methane and water. "The change in methane concentration downwind from a small leak is about the same as the change in methane due to dilution by water vapor that occurs when a rainstorm starts," explained Gregory Rieker, principal investigator on the methane sensing technology development project. "Laser frequency comb spectroscopy allows us to simultaneously, and accurately, measure water vapor and methane. This lets us correct for water in the air, which is critical for detecting very small increases in methane over a large area." The system also calculates background methane concentration, which can change as the wind shifts. This is critical for distinguishing a tiny leak from a change in the overall methane concentration in the air. "A large proportion of the methane emissions that contribute to greenhouse gas emissions from oil and gas are thought to be from intermittent leaks," said Caroline Alden, co-lead author on the study. "To detect and analyze these types of leaks continuously, we developed computational methods that provide a history of how emissions vary over time." The researchers demonstrated the system in a series of tests designed to mimic scenarios that could be faced in an oil and gas field. They housed the frequency comb laser in a mobile trailer and generated multiple beam paths that each covered about a kilometer to a low-cost reflector. For one experiment, the researchers configured the system to quantify a small controlled leak about 1 kilometer from the mobile trailer and 50 meters from the laser beams. In addition to determining when the controlled leak was active and how emission rates changed over 20 hours, the researchers demonstrated measurements of emissions as low as 2 grams per minute. In another test, they placed five potential methane leaks at various locations between multiple laser beam paths. The researchers were able to pinpoint which sources were leaking and determine the emission rates of those leaks. In addition to continuing to refine the system and test it in various scenarios, the researchers plan to work with industry partners to see how the system will perform at actual oil and gas production sites. Working with spin-off company Longpath Technologies, they want to commercialize the technology as a detection service for the oil and gas industry. This research was conducting with support from the U.S. Department of Energy's Advanced Research Projects Agency-Energy (ARPA-E) Methane Observation Networks with Innovative Technology to Obtain Reductions (Monitor) program. The Monitor program aims to foster the development of new methane sensing technology that can be transferred to oil and natural gas production. Optica is an open-access, online-only journal dedicated to the rapid dissemination of high-impact peer-reviewed research across the entire spectrum of optics and photonics. Published monthly by The Optical Society (OSA), Optica provides a forum for pioneering research to be swiftly accessed by the international community, whether that research is theoretical or experimental, fundamental or applied. Optica maintains a distinguished editorial board of more than 50 associate editors from around the world and is overseen by Editor-in-Chief Alex Gaeta, Columbia University, USA. For more information, visit Optica.